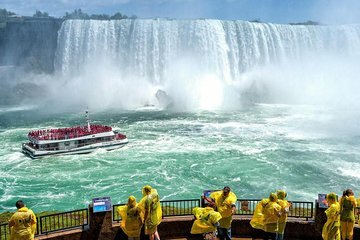 Quittez l'agitation de la ville de Toronto et profitez des magnifiques chutes du Niagara lors de cette excursion guidée d'une journée qui vous fera vivre plusieurs expériences. Sentez la brume sur votre visage pendant une légendaire croisière à bord du Hornblower à la base des chutes du Niagara et profitez d'un déjeuner au restaurant du Sheraton Fallsview Penthouse avec vue sur les chutes du côté américain et canadien. Prenez quelques photos des meilleurs endroits de la région tels que Niagara-on-the-Lake, l'Horloge florale et la plus petite chapelle du monde. Our guide for the tour was Fabio. What a wonderful man. He is very knowledgeable about the area , and gives a lot of explanation during the tour. Nothing is too much for him , he does everything to make the journey successful. He is all the time fully concerned about timing visiting the falls, the area, sights, monuments, winetasting..., and that is really good, because in that way we were able to visit and enjoy so many things in one day. He made the day a ral success, thank you Fabio for that. And useless to say, the Niagara Falls are incredible !! One point of critic about the organisation, is that not all the persons on the tour booked the same things like journey behind the falls and the lunch at the Sheraton. We were the only ones who booked the journey behind the falls and we let it drop because of the group and the smooth timing . But thanks to Fabio yes, him again we got an immediate cashback on that part of the tour. Overall quite good, with much ground covered. Our tour guide, Fabio, was courteous and engaging, happy to oblige picture-taking and small talk. . However, the otherwise positive experience was some dampened by two drawbacks ::(1) In the course of descending into the Niagara falls viewing tunnel our group became separated in the crowd and, in effect, broke apart. Complicating matters, our guide failed to make clear his directives for the meet-up time and place. Confusion and anxiety for us ensured, as it took some time to locate everyone. (2) Our scheduled group luncheon atop the Sheraton seemed to have caught the restaurant unprepared, apparently due to a last-minute addition to the number of people on the tour., resulting in a 15-minute or longer delay being seated while restaurant personnel visibly scrambled to secure additional tables and chairs. This would seem to have spoken to a breakdown in communication between Viator and the Sheraton, whether on site with the guide and the restaurant or at a higher administrative level we can't say. Nonetheless, and in general, a very positive experience, topped off with a pleasant sojourn at the Reif Winery/tasting room at Niagara-on-the-Lake, succeeded by an uneventful bus ride back to Toronto, with everyone safely dropped off at their respective hotels. Very enjoyable tour. Our tour guide, Fabio, was great. Gave us a lot of information about the area and was super friendly. He went above and beyond at the end of the tour to return a cell phone we had left on the bus. We had plenty of time at each stop. Never felt rushed. Good way to spend the day.